Rachel James hit one out of the ballpark with her debut novel, The Forgotten Princess of Emetia. But she follows up with a unique and wonderful sequel in The La st Princess Meigen. Princess Alena is a widow with a young son living at the mercy of her tyrannical father-in-law, the King of Meigen. Much to her chagrin she’s been offered as the price of an alliance with another kingdom. She departs, leaving her son behind. Escorted by Ryce the Warrior and Sherwin, a handsome physician, she finds herself developing an affinity for the medical man. As they journey to Elmetia to meet the king and encounter various trials there, Alena finds herself in love with Sherwin even though she’s duty bound to marry the king. 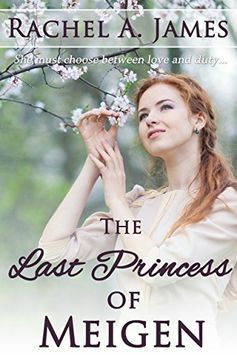 Can she obey the order of her father-in-law and risk the dangers of such an action to follow her heart? Much like J.R.R. Tolkien, James takes the reader to another time and place with a medieval bent except that Ms. James takes us to real-time and place in the early 600’s AD of Britannia. She accomplishes her magic without elves, wizards, dwarves or mystical creatures. With intense research to give her story authenticity she takes what little is known from that time and tells a fictional tale of romance and adventure to please any lover of the genre. Another wonderful story by a fabulous author. I’ve been longing to read Dani Pettrey’s romantic suspense novels for some time and with her new one out I figured this a good time to go and find some older ones and read, since it is a series and I hate reading a series out-of-order. 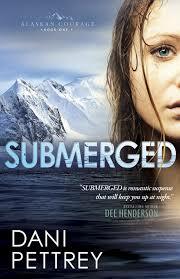 So I picked up Submerged from the public library and was instantly hooked into the adventure of Alaska. Bailey Craig had never intended to return to the land of ice, snow and long memories. In the town of Yancy she had a beloved aunt but also a tarnished reputation due to her own poor choices. Although a believer in Christ now, her past haunts her. Dragged back to attend to the funeral and estate of her Aunt, she comes face to face with her past, and the man she lost along the way, the one who held her heart even when she had broken his. Her aunt was killed in a plane crash and the investigation tosses her time and again in Cole’s way, reigniting pain and passion while at the same time trying to solve a crime. Cole McKenna does rescue drives as a matter of daily life as well as leading adventure tours. Nothing however is more adventurous or dangerous than reuniting with Bailey. She had broken his heart once and he had vowed he would never let her do it again. But Bailey Craig is not the same girl who left Yancy years ago, she is an even more beautiful woman with deep pain and regrets and as they work together to solve a murder, his heart once again softens to this woman. Will they come out of this dangerous quest alive to pursue the adventure of love together? As Cole’s family rally around them, they both find that God does indeed make all things new. I enjoyed this story and had a hard time putting it down. If you love adventure and romance and want a fresh setting for a romantic suspense, this book will suit you well. I look forward to reading the rest of the Alaskan Courage series by Dani Pettrey.